Realm of Riches Video Slot Review - Casino Answers! Realm of Riches is a 5-reel, 20-line video slot developed by Realtime Gaming, featuring a wild substitute symbol, expanding wilds, scatter wins, a re-spin feature, a free spins feature and a progressive jackpot. You can play the Realm of Riches Real-Series Video Slot at Bovada. Bets on the Realm of Riches slot machine are $0.01, $0.02, $0.03, $0.04, $0.05, $0.06, $0.07, $0.08, $0.09, $0.10, $0.25, $0.50, $1, $2.50 and $5 per line. 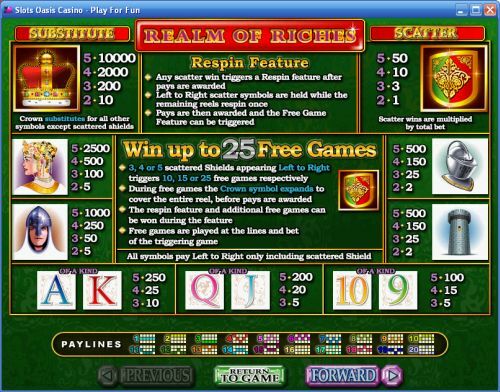 You can select up to 20 paylines on the Realm of Riches slot game. You can bet anywhere from a penny per spin up to the maximum total bet of $100 per spin. You can manually skill stop the reels by pressing the “Stop” button in the middle of any spin you make. To play the Realm of Riches video slot, select your bet and press the “Spin” button. The highest paying symbol on the Realm of Riches slot game is the Crown symbol. 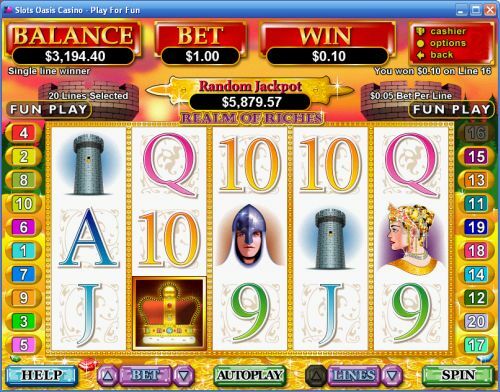 If you land 5 Crown symbols on a selected payline, you will win the 10,000 coin top fixed jackpot. The Crown symbol is wild and will substitute for all symbols except for the Scattered Shield symbol. Other high paying symbols on the Realm of Riches video slot are the Queen (2500 coins) and Knight (1000 coins) symbols. The scatter symbol on the Realm of Riches video slot is the Shield. You only need two scatter symbols to receive a scatter win. You can win up to 50X your total bet by landing 5 Scattered Shields on the reels. Any scatter win will trigger a re-spin feature after payouts are made. Left to right scatter symbols are held while the remaining reels re-spin once. Payouts are then made and the free spins feature can be triggered. 3, 4 or 5 Scattered Shields appearing from left to right will trigger 10, 15 or 25 free spins respectively. During the free spins feature, the Crown symbol will become an expanding wild and cover the entire reel before payouts are made. The re-spin feature and additional free spins can be won during the free spins feature. Free spins are played at the lines and bet of the triggering spin. You can trigger this feature when you play Realm of Riches at Bovada. With a name like Realm of Riches, you can be sure that the Realm of Riches is home to a progressive jackpot. The current progressive jackpot is at $6,384.29. A progressive jackpot can be won at the conclusion of any spin you make on the Realm of Riches online slot game. The jackpot is triggered at random. Progressive Jackpot wins are added to payline and scatter wins. Random Jackpot contribution is no more than 1.5% of total Return to Player. Realm of Riches has an advanced autoplay mode. Hit the “Autoplay” button to open the autoplay settings. You will be able to set the number of spins, set it to stop when the jackpot is won, stop if a win exceeds or equals (any amount you input), stop on any win, stop if your balance increases/decreases by any amount you input and stop once the feature is triggered. You can stop Realm of Riches’s autoplay mode using the “Stop Auto” button to deactivate it. The Realm of Riches is made interesting by its re-spin feature that can easily trigger the free spins feature. It also has an excellent top payout and a progressive jackpot. You can play the Realm of Riches video slot when you sign up and make a deposit at Bovada! Where can American players play the Realm of Riches slot game? You can play the Realm of Riches video slot when you sign up and make a deposit at a Realtime Gaming online casino such as Bovada.